Released exclusively as an e-book, the new edition, following the success of its inaugural edition last year, features editorial contributions from two dozen technology opinion leaders around the world. Each shares his or her outlook on the developments and innovations that will affect several key areas of hotel technology in the next few years, from revenue management systems to wearables and robotics. LAUSANNE, SWITZERLAND – 15 September 2014 - Wade & Co. SA, the Swiss-based publisher of The Hotel Yearbook, an annual compendium of expert opinion and insights on the future of the hotel industry, announces the launch of The Hotel Yearbook 2015 – Technology, the second year this Special Edition has been published. The 76-page publication examines the changing technology landscape in the world of hospitality. "Since its inception in 2007, the editorial concept of The Hotel Yearbook has been to bring together senior hotel industry executives and recognized experts and thought leaders from every part of the industry to write about foresight and innovation in the global hotel business," said Woody Wade, publisher. "The aspect of the business that this Special edition focuses on, technology, is especially dynamic – and will have a huge impact on profitability, competitiveness, efficiency, and guest experience." Rapidly evolving technological innovations are reshaping every aspect of the hotel industry, from automating processes to communicating with guests via mobile apps. The new publication covers these and many other topics. The Hotel Yearbook 2015 – Technology is being published with two partners, the professional association HFTP (Hospitality Finance and Technology Professionals) and Hsyndicate, a provider of online industry intelligence based in the Netherlands. "Technological developments are driving huge changes in this industry," said Frank Wolfe, CEO of HFTP. "The Hotel Yearbook 2015 – Technology provides readers with plenty of food for thought about the many trends that they need to follow to stay ahead of the curve." Publisher Woody Wade adds: "It's a challenge for managers in the hotel industry to stay abreast of all the possibilities being created by the fast-paced technological changes going on. These developments will affect almost everything in the hospitality space. For that reason, The Hotel Yearbook 2015 – Technology is a must read." The publication features articles written by 25 industry leaders and experts, from the CIOs of major hotel groups such as Starwood and Kempinski to highly respected international consultants, entrepreneurs and academics. The e-book, about 76 pages in length, is available only online at www.hotel-yearbook.com. The Hotel Yearbook is a family of publications that call upon a wide-ranging group of senior executives, analysts, consultants and opinion leaders from all over the world to ask, "What lies ahead for the global hotel industry?" 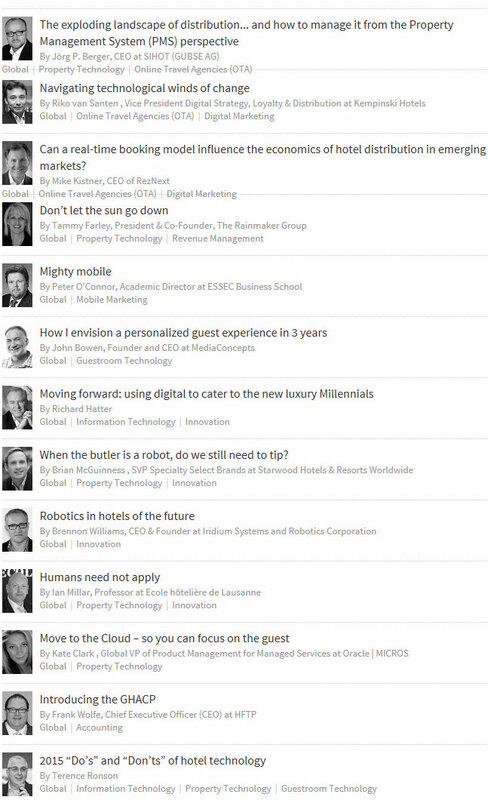 In The Hotel Yearbook – whether it is the highly respected annual edition or any of the special editions focusing on such critically important themes as technology, talent development, or digital marketing – its forward-looking contributors share with readers the key trends and developments that they believe could have an impact on the performance of the hotel industry in the future. Visit www.hotel-yearbook.com. HFTP, founded in 1952 and based in Austin, Texas, and Maastricht, The Netherlands, is the global professional association for financial and technology personnel working in hotels, clubs and other hospitality-related businesses. HFTP provides first class educational opportunities, research, and publications to members around the globe including, the premiere hospitality technology conference HITEC--founded in 1972. HFTP also awards the only hospitality specific certifications for accounting and technology --the Certified Hospitality Accountant Executive (CHAE) and the Certified Hospitality Technology Professional (CHTP) designations. HFTP was founded in the USA as the National Association of Hotel Accountants. Visit www.hftp.org.